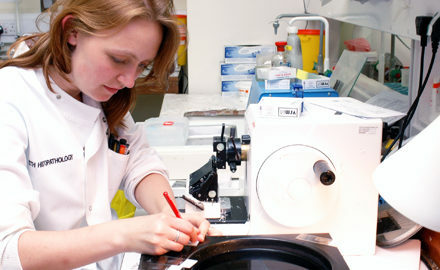 To train to be a consultant clinical scientist in any pathology specialty, you’ll first need to become a registered clinical scientist, and then complete a five-year Higher Specialist Scientist Training programme – or demonstrate that you have achieved equivalent education, training and experience. Higher Specialist Scientist Training will equip you with both the knowledge and practical experience you need to oversee a pathology laboratory or service. With the support and supervision of your senior colleagues, you’ll gradually gain more independence, and will have opportunities to teach, take part in research, conduct clinical audits and lead on quality improvement activities. train as a biomedical scientist and then use your existing knowledge and experience to gain either an IBMS certificate of attainment or a Certificate of Equivalence from the Academy of Healthcare Science. You’ll then be able to apply for registration as a clinical scientist with the HCPC. With the right qualifications, you can apply for a trainee healthcare scientist post. These are advertised and co-ordinated nationally, through the Modernising Scientific Careers (MSC) scheme. The Scientific Training Programme (STP) lasts three years, and contains a mix of academic study and practical work experience. On completion of the STP, you’ll be awarded a Certificate of Completion of the Scientist Training Programme by the National School of Healthcare Science. Learn more on the National School of Healthcare Science’s website. Clinical scientists can also apply to the Academy of Healthcare Science for a certificate of equivalence. Your education, training and experience will be assessed against the outcomes of a relevant Scientist Training Programme (STP). Learn more on the Academy of Healthcare Science website. If you’re already working as a biomedical scientist, you can use evidence from your career to gain an IBMS certificate of attainment. You’ll need to share evidence of your education, training and experience with the IBMS Assessment Panel, who will assess whether you meet the HCPC’s standards of proficiency for clinical scientists. Learn more on the IMBS website. Once you’re registered as a clinical scientist with the HCPC, you can apply to a training post on a Higher Specialist Scientist Training (HSST) programme, registering as a trainee with the National School for Healthcare Science. Your training will last five years. As part of it, you’ll need to pass the College’s FRCPath Part 1 and Part 2 examinations in your chosen specialty. What will my training look like? Higher Specialist Scientific Training (HSST) will equip you with specialist skills and knowledge to manage a pathology laboratory or service. This will involve experiential working in the specialism, gaining practical and clinical skills, and observing, assisting and discussing aspects of practice with senior and consultant scientific and medical staff, patients and other members of the multi-professional team. The core HSST training programme will develop your understanding of diagnosis, patient management and the meaning of Good Scientific Practice (GSP). You’ll need to demonstrate key aspects of professional competency, including using your communication skills effectively and working with standards of evidence-based medicine. As a clinical scientist you will also be expected to seek out and organise experiential or opportunistic learning opportunities for yourself, such as attending team and directorate meetings in your specialty, teaching undergraduates and other health professionals, or completing doctoral-level research. The Academy of Healthcare Science HSST Equivalence route: Similar to STP equivalence, the Academy of Healthcare Science offers a Certificate of Equivalence for HSST. Your education, training and experience will be assessed against the outcomes of a relevant HSST curriculum. Learn more on the Academy of Healthcare Science website. Understand more about the HSST curriculum and the role of consultant clinical scientists in healthcare. "With patients, there are so many positive achievements. I don’t so much feel proud, but rather privileged to be involved at this point in their lives."